While students used a 32-day sit-in to gain student body, faculty and alumni support, college administrators chose to side with the fossil fuel industry. On Saturday, Swarthmore College’s Board of Managers, the school’s oversight body, bucked majority student support, a near-unanimous faculty resolution and a growing international movement by choosing to maintain the school’s investments in coal, oil and natural gas. Echoing their colleagues at the University of California, Harvard and a host of other institutions, the Swarthmore’s Board of Managers announced that, “After long and deep discussion and debate” they would not be modifying investment guidelines to “meet social objectives.” Yet, at the same time, they assured readers that Swarthmore will “play a leadership role in helping curb the seemingly insatiable appetite for fossil fuel.” At $1.9 billion, Swarthmore — a school of just over 1,500 undergraduates — has one of the country’s largest per-student endowments in higher education and is among the 400 colleges and universities being called upon to divest from fossil fuels. As a 2014 Swarthmore graduate and founding member of Swarthmore Mountain Justice — the student campaign leading divestment efforts at the college — this was my most anticipated news item of the year. Along with the campaign’s current leadership, I spent Saturday afternoon helping disseminate press releases, fielding calls from reporters and letting out more than a few heavy sighs. This is no more true than at Swarthmore. The climax of this semester was a 32-day sit-in at Swarthore’s finance and investments office, the longest in college history, and the first in a string of escalated direct actions that stretched from Yale to Washington’s Whitman College to the University of Massachusetts-Amherst and more — a crescendo planned jointly by the Divestment Student Network and 350.org. Across campuses, organizers posed a simple question to their boards, administrations and — to some extent — the public: “Whose side are you on?” Polarizing the campus worked to the group’s advantage. Concluding the sit-in at Swarthmore, SMJ celebrated an overwhelmingly-passed faculty resolution in favor of divestment. In the past, faculty support has been a tipping point in successful campaigns for a living wage for campus workers and for divestment from South African apartheid in the 1980s. 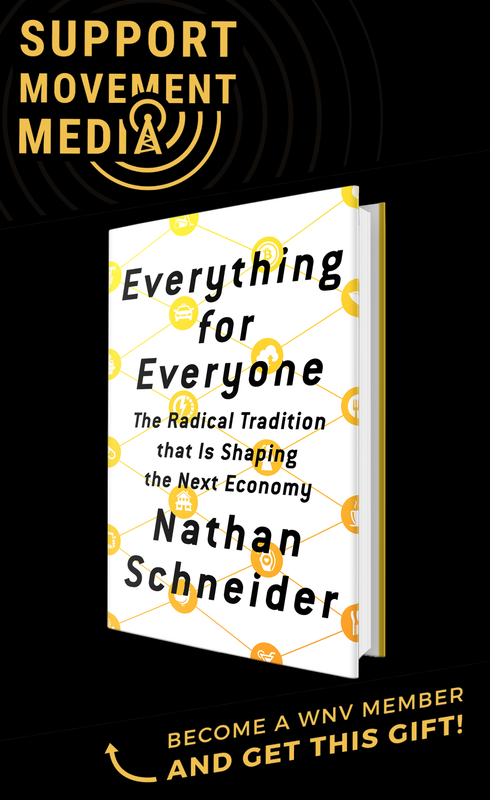 Off-campus, some of the college’s higher-profile alumni issued statements in support of the campaign, including economist Dean Baker and U.N. Climate Chief Christiana Figueres. Writing to Swarthmore students and administrators, Figueres explained that, “When students, faith leaders and citizens all around the world call for a shift in investments from high to low carbon, they are voicing the moral imperative to align financial decisions with our highest sense of accountability, both across segments of society, as well as across generations.” To date, 200 institutions, ranging from Syracuse University to a $37 billion Swedish pension fund to the Guardian to the World Council of Churches have all chosen to divest. 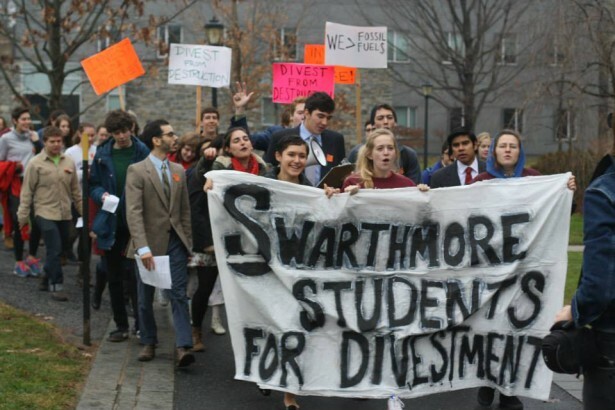 Nearly five years on, Swarthmore’s fossil fuel divestment campaign has racked up as much experience as its battered cardboard protest signs would indicate. When I arrived on campus this weekend, 19-year-old organizer Stephen O’Hanlon was sitting hunched behind a laptop in the cramped hallway talking to reporters. While on the phone, a Guardian reporter called him. “I’m talking to the New York Times on the other line,” O’Hanlon blurted out. “He’s on deadline, are you on deadline? Great. I’ll call you back.” While Swarthmore’s board may have chosen not to divest, student organizers, if that exchange is any indication, are more prepared than ever to continue the campaign. Of the small handful of stories released about the decision over the weekend, perhaps the most interesting one was from the conservative Washington Times. Within it, a spokesman for the Independent Petroleum Association of America — an industry lobbying group — “applauded” the board, saying, “Today Swarthmore joined numerous schools across the country like Harvard, Yale and Middlebury in rejecting an anti-fossil fuel political campaign,” affirming the sentiment in the most recent New York Times Sunday Review. As intransigent board members and administrators continue to pay lip service to “greening” their campuses, they are increasingly finding themselves in the awkward spot of having more common ground with fossil fuel executives and climate deniers than their own students, faculty and alumni.